With local pubs going under at a rate of 26 a week, those pulling the pints have to be astute enough to recognise how their business is going to work in today’s world. 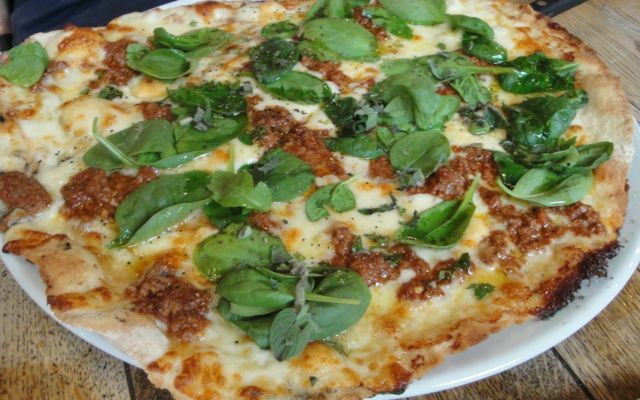 The Plough Harborne’s winning approach is offering an all day every day service of reasonably priced well cooked food, served up by friendly Hollister-model waiters and waitresses, with a side of premium lagers or carafes of Pinot Grigio. The Plough offers a number of deals to entice the large student and young professional population in the vicinity. On Monday there’s buy one get one free on pizzas, and Tuesday is BOGOF on burgers. For the yummy-mummies there’s the brunch menu until 12.30 then afternoon tea 2 till 5. There’s small plates and sandwiches for lunch, and as well as the pizzas and burgers there’s fish & chips, chilli and other pub favourites for dinner. We popped in for a quick pizza on a Monday night. I don’t do queuing but luckily we’d booked a table, it was super busy and the wait on tables was considerable – don’t expect to turn up here and be able to get a table on spec, you’ll almost certainly have to wait whatever the night. It was a young crowd for BOGOF pizza night, and there was a loud hubbub and a friendly atmosphere. It’s not somewhere I’d go on a date, but definitely a place to go with friends to have a noisy fun dinner. There’s a nice outside courtyard to sit in to boot. 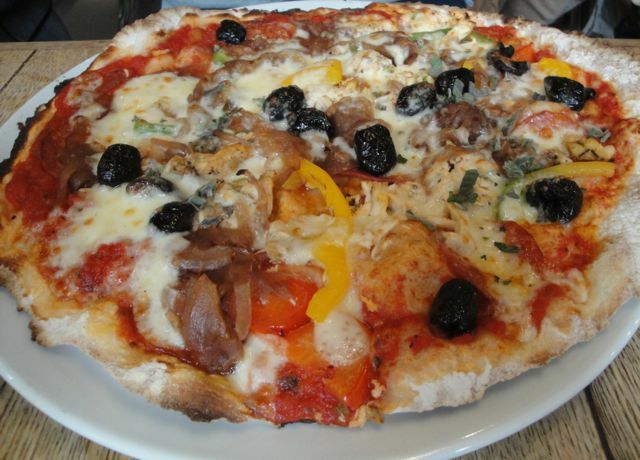 I had the crayfish, capers, tuna, anchovies, and black olive pizza – they really should name them because reeling off the ingredients as you order is tiresome. The balance of cheese, tomato, and topping was good, and the base thin and crispy. I love anchovies and capers and there was plenty on there. 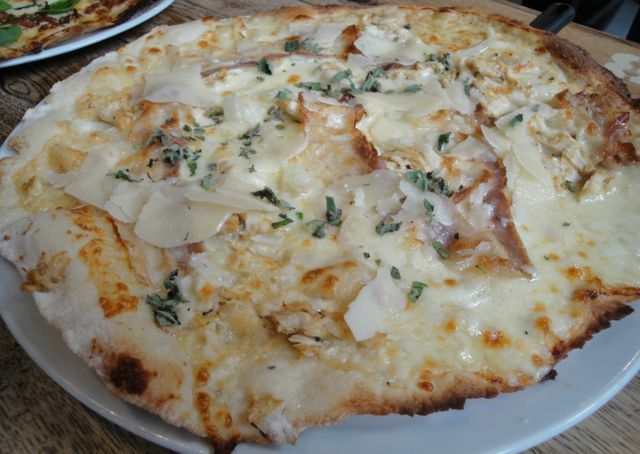 We also had a white pizza, that’s with a white sauce instead of tomato, with pancetta, onion, and parmesan, and they let us add on cajun chicken. I like that even on such a busy night they were willing to swap around toppings – they’re definitely a customer centric venue. On the BOGOF deal we paid under £20 for two pizzas, some red cabbage slaw, fries, and two premium pints (Amstel and San Miguel), usually it would’ve come to around £30 – still fairly cheap! We can’t really comment on the other food but several of our friends (who understand how pinickity we are) have told us that it’s always good. Good idea, well executed, keep up the food work guys. 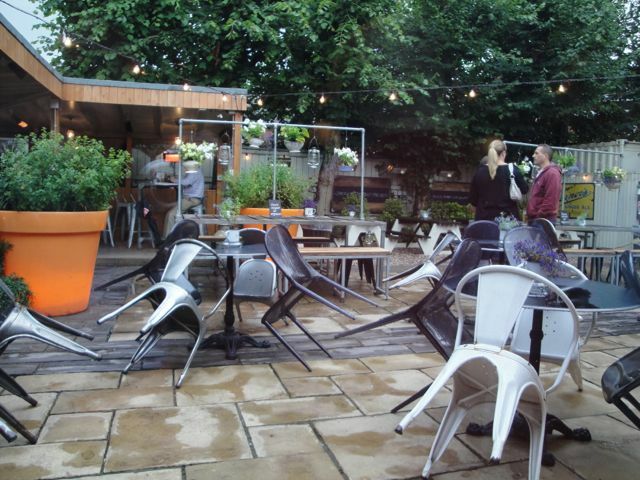 This entry was posted in Area: Harborne, Cuisine: English, Cuisine: Modern Mixed, Price: Average, Price: Cheap as Chips - Inexpensive, Venue type: Bar, Venue type: Cafe, Venue type: Pub, Venue type: Restaurant and tagged Birmingham Restaurant, birmingham restaurant review, birmingham review, Harborne Restaurant, Harborne Review, Out In Birmingham, out in brum, OutInBrum, restaurant review, Where To Go In Birmingham. Bookmark the permalink.